OPEN AIR PUBLISHING: NSW PENSIONERS COUNCIL RATES DISCOUNT - NOT CHANGED IN 29 YEARS!!!! NSW PENSIONERS COUNCIL RATES DISCOUNT - NOT CHANGED IN 29 YEARS!!!! Until you get there, you don’t know about the things that affect you later in life. 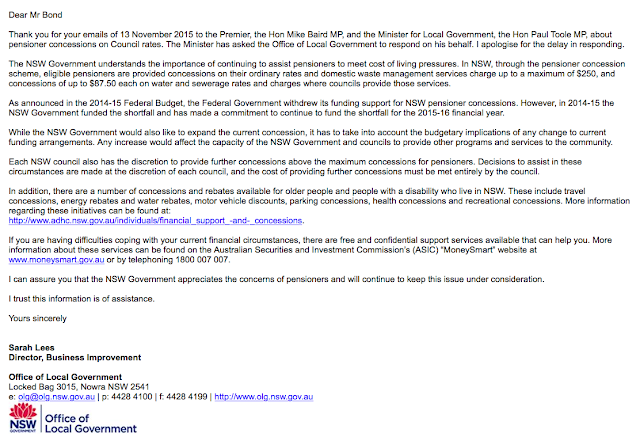 This is about the Pensioner Discount Rate (NSW) on your Council rates. Well, we know the Government is going to keep them. The discount rate was introduced in 1989 by the NSW State Government as a $250 discount on your Council rates. IN 2018, THAT RATE HAS NOT CHANGED, ONE IOTA, IN 29 YEARS!!! In 1990 I paid 1100 bucks to Wollongong City Council in annual rates and got a garbage service once a week for it. Ah, the VG has gone up to 502,000. So with that the Gong Council should explain how can a person of limited means, or anyone for that matter, not lose their home if it's not pay off? By comparison, a friend’s property at Mt Colah has a VG of 541,000 and he pays $390 a quarter compared to my current $514 a quarter. How fair is that? Wollongong City Council are coming out with all sorts of plans on how they can ease the burden of pensioners paying their exorbitant rates with different pay off plans so you can live in your own house. But one of the plans is NOT giving a further discount. They don’t get it, do they? However you can fill out a form for the deferral of rates till you are either deceased or sell the property. Something that was recently suggested for All pensioners but dismissed as an option. Apparently not with the Gong Council. For a single person like me, it could be very advantageous. Though the catch is, if you’re still around in 20 years, they can go after the deferred rates. By my reckoning Pensioner Rates Discount should be at least $500 now at today's living expenses, if not more. Certainly it should be paced with the CPI. Everything else relevant has the CPI added. So the final point is, if this affects you, what are you going to do about it? 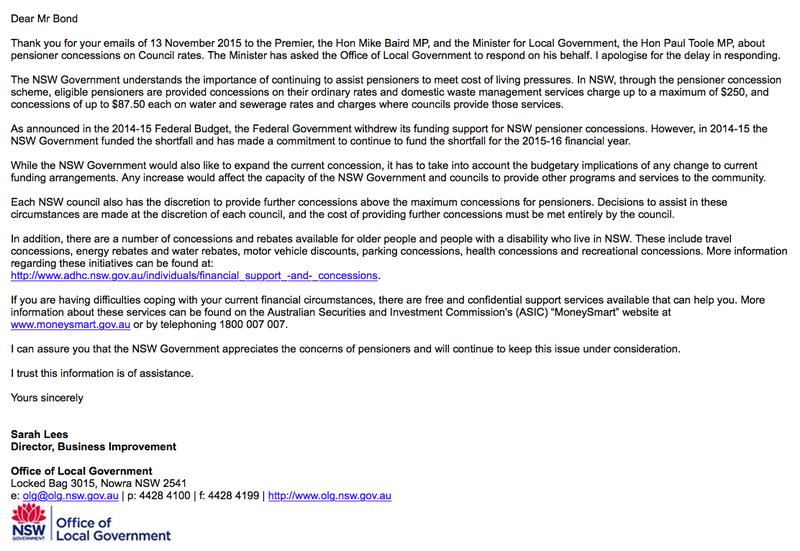 I suggest you write to your local member and Council for an increase of the Pensioner Rate Discount, and if you're a pensioner group, write individually and a group letter.